The Sarngapani Temple, (note: it is not SARANGApani) is located in Kumbakonam of Tamil Nadu, India, situated in between Cauvery and Arisalar rivers. 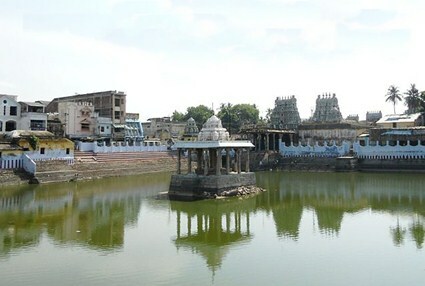 The temple is one of the 108 Divya Desams.As per legend sage Hema Rishi performed penance in the bank of Potramarai (Golden lotus)tank to be blessed with Goddess Lakshmi as his daughter. Sri Maha Vishnu was pleased by the penance and Hema rishi's wish was granted and Lakshmi emerged out of the Potramarai tank among thousand lotuses and was thus named Komalavalli (the one who emerged from lotus). Later Sriman Narayana descended to earth as Aravamudhan in a chariot drawn by horses and elephants from his abode Vaikuntam. He stayed in the near by Someswaran Temple to marry Her and the couple eventually got married. The name Sarngapani is derived from Sarnga the bow of Sri Rama and pani meaning hand - the one holding the bow in his hand is Sarngapani. There is a "Paadhala Srinivasar" in this temple which is related to the above tale. Sarangapani temple has the tallest temple tower in the town. 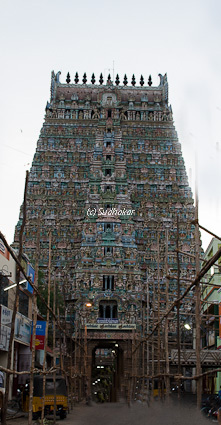 It was built by Cholas and later maintained by Madurai Nayaks. The rajagopuram has eleven tiers and has a height of 173 feet. There are five other smaller gopurams in the temple. The rajagopuram has figures depicting various religious stories. The temple faces east and the Potramarai tank is located in the western entrance. This temple is along Kaveri and is one of the Pancharanga Kshetrams. The main sanctum is in the form of a chariot drawn by horses and elephants with openings on either side, showing the descent of Sarangapani from heaven in this chariot. There is a sculptural representation of the sage Hema rishi in the western part of the temple. The central shrine is for Sarangapani in sayana kolam (sleeping posture), where Sarangapani rests his head in his right hand. Lord Brahmma is above His naval and Sun on the head side. 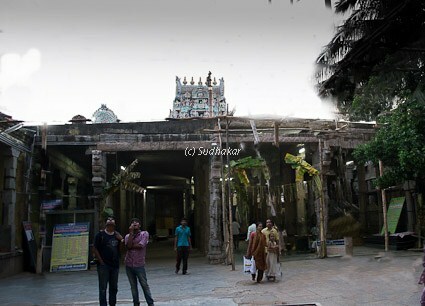 There are two entrances to the sanctum named as Utharayana Vaasal (Northern gate)that is opened from 15th of January to 15th of June and Dhakshanayana Vaasal( southern gate) is opened the next six months period. As per a legend, once there lived a devotee called Lakshmi Narayanswamy and he was great devotee of Aravamudhan and spent most of his life to the service of the deity.He was the one who built the Rajagopuram of the temple. At the end of his life, he felt his lonliness and prayed for his karma to be performed. Aravamudhan descended himself to perform the last rites on a Deepavali day. The ritual is performed annually by the priests and is one of its kind where death rituals are performed in the precincts of a temple. This event is performed during the midday puja but devotees are not allowed to see this ceremony. The Moolavar of this temple is Sri Saarngapaani. Aara Amudhan, Abayaryaapthamiruthan and Utthanasayi are the other names of Moolavar. Prathyaksham for Hema Maharishi. Moolavar is in Udhyoga sayana posture , he appears as though rising from sleep. Thayar of this sthalam is Komalavalli Thaayar. Marghazhi ( mid Dec - mid Jan) - Pahal pathu for 10 days and Rapathu 10 days, Pongal Utsavam . Temple location In the heart of Kumbakonam town. Where to Stay? There are several budget hotels and deluxe hotels in Kumbakonam. Other interesting places around Kumbakonam townKumabakonam is a town with a lot of important temples within a radius of 20 kms including many more of 108 divya sthalams, Navagraha stahalams and within the town itself there are many heritage temples dedicated to Lord Shiva and Narayana. The Mahamaham tank is very famous and religiously as important as the Kumbh mela. Once in twelve years during Masi maham, lakhs of devotees gather here for a holy dip. Contact Sri Sarangapani Temple, Kumbakonam – 612 001, Thanjavur district.